Our Laser Engraving Process: With 35 years of laser engraving experience, we have developed a brick laser engraving process that meets the highest standard of quality. Our expert laser technicians have designed techniques and laser processes to meet a multitude of laser engraving needs. Why laser engraving instead of other options? We invite you to read on. Laser engraving is a natural and permanent process. The method is quite simple; the beam melts the clay of the brick into the desired mark. The laser mark is smooth, hard, and adhered permanently to the surrounding brick material. The sandblasting method is more complicated and much less durable. To achieve a mark, the material of brick is first blasted out of the surface of the brick and then filled with an epoxy or paint to create a contrast. With time these added materials weather and break down, leaving an unclear mark and deteriorating brick. Laser Marking Will Last a Lifetime: Each laser engraved brick is a small monument of memorabilia and will endure for generations. Our laser mark will last as long as the brick itself – we guarantee it. Laser Marking is Maintenance Free: Due to the nature of the laser engraving, the surface of the mark is smooth and hard. Simply wash away dirt and debris to expose a crisp, undamaged mark. The mark will never loose it’s clarity or luster. Unlimited Marking Capabilities: Superior laser brick engraving technology along with creative ideas results in limitless capabilities. Fonts, logos, clip art, even custom artwork like children’s drawings can be integrated into any campaign. 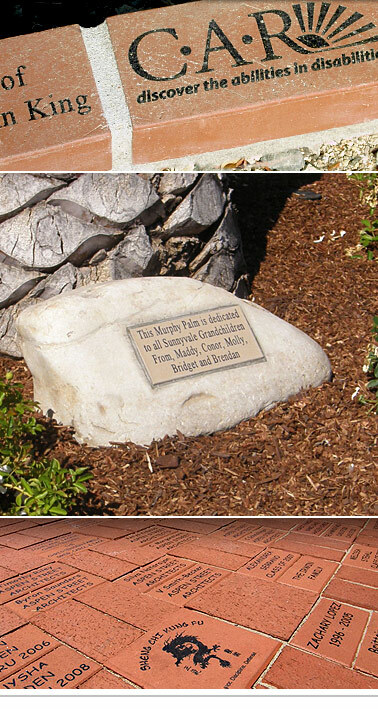 A Brick Can Be “GREEN”: Laser Engraving is a natural and environmentally responsible option when revitalizing your community. No additives. All natural. Long lasting.